The Crown of Charlemagne from 1271, used as French coronation crown from 875 or 1590 to 1775. It was probably created as a simple circlet of four curved rectangular jewelled plates for Charles the Bald, the grandson of Charlemagne, but later, four large jewelled fleur-de-lis were added to these four original plates, probably by Philip Augustus around 1180 and surmounted by a cap decorated with precious stones. At this time a similar but open crown, the one of the queen, existed too. One of them was melted down in 1590 by the Catholic League during the siege of Paris. The remaining crown was used up to the reign of King Louis XVI, who was crowned in 1775 in the Cathedral in Reims. The crown of Jeanne d'Évreux was then used for the coronation of the queens. French kings had also their personal crowns, worn after the coronation, during the banquet held at the Palace of Tau, like the crown of Saint Louis called the Sainte Couronne de France, Henry IV or Louis XIV which were later donated to the treasury of the Abbey of Saint Denis near Paris, the traditional burial place of the Capetian dynasty. Only one of the 11 personal crowns of the Ancient Regime remains, the Crown of Louis XV, manufactured for the coronation of Louis XV in 1722, and 5 crowns from the 19th century. The coronation crown, the Crown of Charlemagne, was destroyed in the French Revolution, like some of the regalia. From the Ancien Régime regalia, except for Louis XV's crown, the Throne of Dagobert, the medieval coronation sword of the French kings Joyeuse, the spurs, the brooch said of Saint Louis, the ivory sceptre, called Hand of Justice, the sceptre of Charles V, as well as the antique cup of the Ptolemies with its paten or the coronation chalice kept in Reims survived. The Imperial Crown of the Holy Roman Empire or Reichskrone, probably made for the coronation of Otto the Great in 962 at the workshops of the imperial monastery of Reichenau, was also later identified as the Crown of Charlemagne and as such appeared on the escutcheon of the Arch-Treasurer of the Holy Roman Empire and at the top of the coat of arms of the Habsburg emperors at the Hofburg Palace in Vienna. 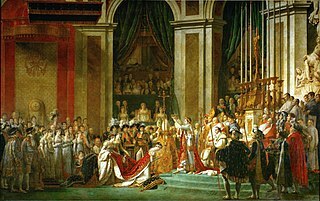 When Napoleon proclaimed himself Emperor of France, he also called his own imperial crown the "Crown of Charlemagne". Wikimedia Commons has media related to Crown of Charlemagne. ^  One of the cupboards of the treasure of Saint Denis with five crowns including the ones of Charlemagne down right and of the Queens down left. ^  Crown of Queen Jeanne d'Évreux in the treasure of Saint Denis in 1706, from Dom Michel Félibien, Histoire de L'Abbaye Royale de Saint-Denys en France. ^  Crown of Saint Louis in the treasure of Saint Denis. ^  Crown of Saint Louis or Sainte Couronne de France. ^  One of the cupboards of the treasure of Saint Denis with four crowns including the ones of Louis XIV and, down right, of Saint Louis. ^  The 14 royal crowns in the treasure of Saint Denis in 1706, from Dom Michel Félibien, Histoire de L'Abbaye Royale de Saint-Denys en France. ^  Plates of the treasure from Dom Michel Félibien, Histoire de L'Abbaye Royale de Saint-Denys en France, 1706. 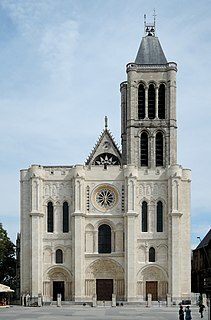 The Basilica of Saint-Denis is a large medieval abbey church in the city of Saint-Denis, now a northern suburb of Paris. The building is of singular importance historically and architecturally as its choir, completed in 1144, shows the first use of all of the elements of Gothic architecture. Jean Le Veneur, son of a Norman baron, was a French Abbot, Bishop, Courtier, royal official, and Roman Catholic cardinal. Lièpvre is a commune in the Haut-Rhin department in Grand Est in north-eastern France. A monastery was built here in the eighth century by Saint Fulrad, who filled it with relics of Saint Cucuphas and Saint Alexander. The Cup of the Ptolemies, also known as the Cup of Saint Denis, is an onyx cameo two-handled cup, or kantharos. The cup, decorated with Dionysiac vignettes and emblems, was carved at some point in Classical Antiquity, probably in Alexandria. Eventually, it found its way into the treasury of the French kingdom, before it was donated to the abbey of St. Denis. During the Middle Ages, it was used as a Christian chalice, and lavish mounts were added, with Latin inscriptions. In 1804, the cup was stolen, and the mounts were lost, although the cup itself was recovered. It is now in the Cabinet des Médailles at the Bibliothèque Nationale de France, Paris. Michel Félibien was a French historian, who wrote a five-volume history of Paris, unfinished at his death, but completed by Guy-Alexis Lobineau and published in 1725. Lyre Abbey was a monastery in Normandy, founded in 1046 at what is now the village of La Vieille-Lyre. From the mid-12th century it was a Benedictine house. It was abolished at the French Revolution and the abbey buildings mostly destroyed.